I have a large collection of good panel meters, but find that many of them are not sensitive enough. Could you print a simple, one-transistor circuit to “pep” them up using a 2N2222 or similar transistor? Would you go for an op-amp? The circuit below is what is sometimes called a current-to-voltage converter. We recognize it as an inverting op-amp. Actually, they are one and the same. In this configuration, the output of the op-amp is forced to feed back a current equal to the input current through Rf. This way, the op-amp is in “balance.” If the Rf is greater than zero, then the output voltage must increase to compensate for the Rf current loss. For example, if the input current is 100 µA and Rf is 10K, the output voltage must be 1 volt to force enough current through Rf to equal the input current. If the input current is 10 µA, then Rf becomes 100K with a 1 volt output. The formula is -V(out) = I(in) x Rf. Now, let’s go to the other end of the equation, where the output voltage translates into a current to drive your panel meter. For this example, I’ve selected a 0-1 µA panel meter — a very common analog meter you can find at RadioShack under the guise of a 15 volt panel meter (22-410). With the values shown, a 100 µA input will generate a 1 volt output. Using Ohm’s Law (R1 = E/I = 1/.001 = 1K, where .001 is the full-scale of the meter), we need a 1K resistor. If you’re using a 10 mA meter, R1 becomes 100Ω. By changing the value of R1, you can make any meter into a 100 µA meter — up to a point. 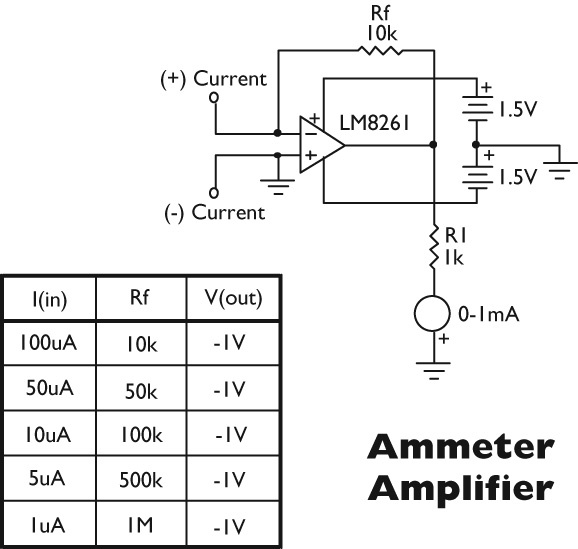 The current output limit of the LM8261 is about 50 mA; that is, it won’t drive a 100 mA meter. I chose this op-amp because it’s small, has rail-to-rail output, and can work on two 1.5 alkaline batteries, but feel free to replace it with just about any general-purpose op-amp, as long as you meet its minimum operating voltage requirements (e.g., ±5 volts for the LF353).